Kaba Aye Pagoda (Gaba Aye Pagoda;World Peace Pagoda), formally Thiri Mingala Gaba Aye Zedidaw is a pagoda located on Kaba Aye Road, Mayangon Township, Yangon, Myanmar. The pagoda was built in 1952 by U Nu in preparation for the Sixth Buddhist Council that he held from 1954-1956. The pagoda measures 111 feet (34 m) high and is also 111 feet (34 m) around the base. 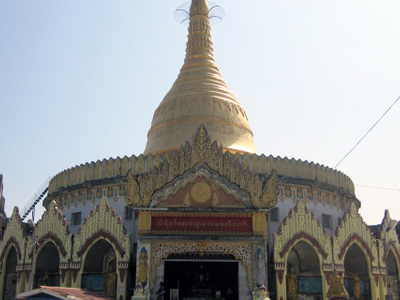 The pagoda is located approximately 11 km north of Yangon, a little past the Inya Lake Hotel. The Maha Pasana Guha (great cave) was built simultaneously with the Kaba Aye Pagoda and is located in the same complex. The cave is a replica of the Satta Panni cave, located in India, where the first Buddhist Synod was convened. The six entrances of The Maha Pasana Cave symbolize the Sixth Great Synod. The cave is 455 feet (139 m) long and 370 feet (110 m) wide. Inside, the assembly hall is 220 feet (67 m) long and 140 feet (43 m) wide. As prime minister of Burma, U Nu built the Kaba Aye Pagoda and the Maha Pasana Guha Cave in 1952 in preparation for the Sixth Buddhist Synod that he convened and hosted and which lasted two years, from 1954–1956. This Synod coincided with the 2500-year anniversary of Buddha’s enlightenment. In Burma, the kings traditionally built a pagoda in their honor to stand as a relic of their rule. For example, Ne Win built the Maha Wizaya Pagoda in his honor. 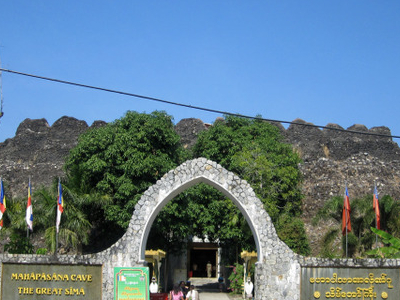 The construction of the pagoda and cave were a part of U Nu’s attempt to establish Buddhism as the official religion of Burma, thereby creating a Buddhist state. The Kaba Aye pagoda is open daily from 6 am to 8 pm, with an admission fee of $5. In addition to the Burmese who make religious pilgrimages, the pagoda attracts domestic as well as foreign tourists. The Kaba Aye Pagoda compound is large and is intended to be peaceful and quiet for the tourists, monks and devotees who visit. The circular platform surrounding the main pagoda is enclosed in the style of a cave-temple. There are five porches decorated with colorful arched pediments. Lotus flowers, lotus buds and swastikas are carved in stucco around the outside. The main pagoda is 117 feet 6 inches high, with smaller pagodas on the five porches each 8 feet (2.4 m) high. Vendors sell handmade products on the entrances to the pagoda. The pagoda, which is hollow, has a middle point inside which features four great Buddhas (four great pillars) in commemoration of the four Buddhas who have already appeared in the world. A room inside the pagoda houses Buddha relics, including a large silver statue of Buddha, over eight feet tall. There is also a room inside the pagoda, which is used to keep Buddha relics. 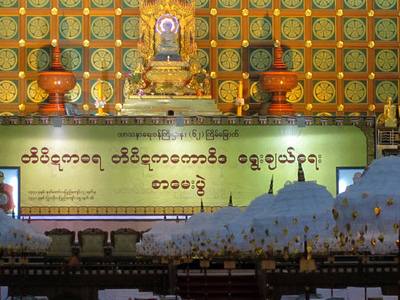 Here's the our members favorite photos of "Religious in Yangon". Upload your photo of Kaba Aye Pagoda! Connect with Hein Pyi and Kyawswar who have already visited Kaba Aye Pagoda.